I wrote this white paper a while back. 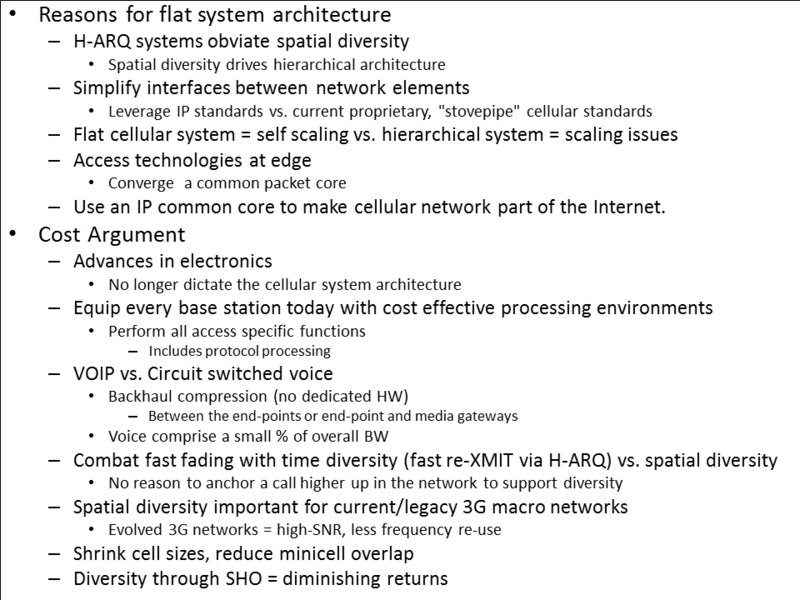 This paper discusses the evolution from hierarchical to Flat IP Architectures for mobile networks. 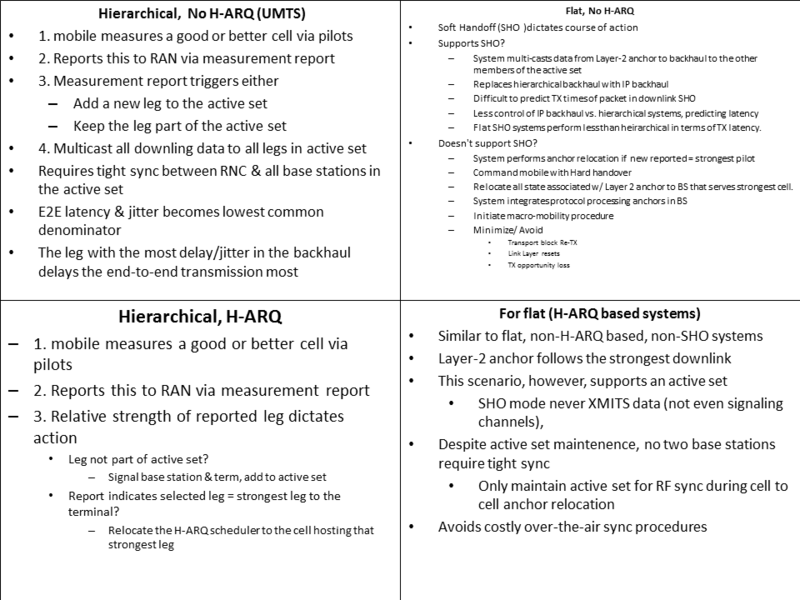 This information may be of interest to mobile network architects, especially in light of the emergence of Software Defined Radio Access Networks (SD-RAN). This paper briefly discusses the components of 3GPP evolution to include Long Term Evolution (LTE). This paper focuses on the benefits of a flat Internet Protocol (IP) architecture, and contrasts the flat architecture to the traditional hierarchical and centralized (which I refer to as H/C) approach, with a focus on scalability. 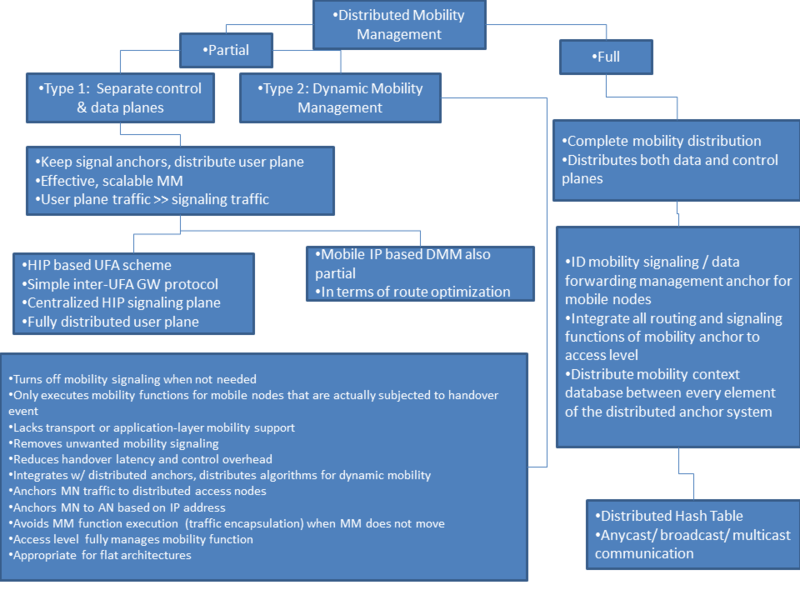 This paper also looks at the evolution of mobility management (MM) in relation to flat and H/C architecture scalability, and discusses MM approaches to include Dynamic Mobility Management (DMM). After a brief discussion of the LTE components, we now focus the rest of the paper on the packet switch entities. This paper concentrates on Flat vs. H/C architectures and their approaches to MM. For space considerations, I’ve synthesized the following table from the text of [Bokor 41]. 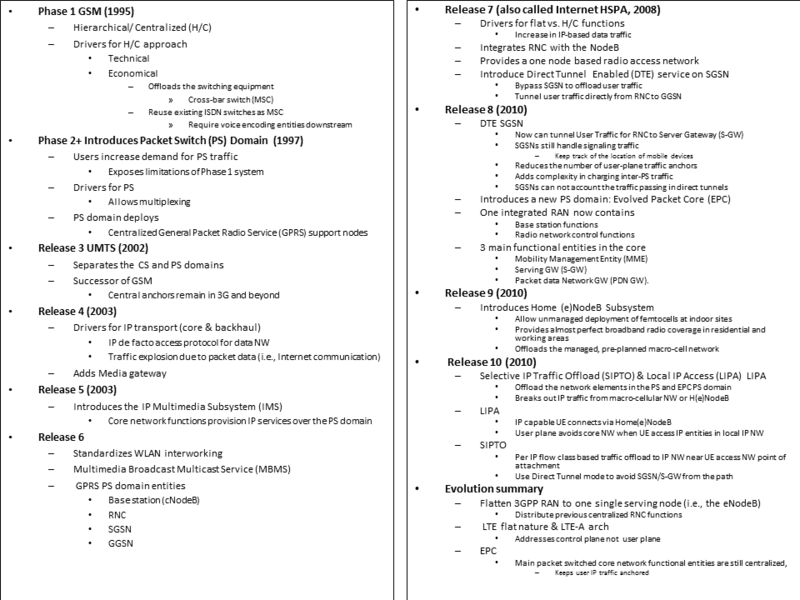 The table illustrates the evolution of packet switch (PS) NW in mobile communication systems. In addition to inter-entity, inter-layer protocols, key single nodes-in-the-loop prevent scalability. Anchor points illustrate the concept of key single nodes in mobile system. Anchor points play a major role in both Flat and H/C architectures, in terms of Mobility Management (MM). For anchor points, 3GPP UMTS uses GGSN, SAE uses P-GW and WiMAX uses CSN. Anchor points allocate IP addresses and establish tunnels. For each IP address and tunnel, the Anchor Points maintain “contexts” that contain binding ID, tunnel ID and QoS information. The anchor points update contexts and use them to filter and route user traffic to and from end terminals. Network elements (incl. anchor points) maintain finite simultaneous active contexts. To increase the number of maintained simultaneous active contexts, operators must install new equipment or upgrade old equipment with more capacity. [Bokor 45]. Mobile network engineers investigate MM alternatives to anchor points that maintain contexts, in order to prevent CAPEX. The H/C approach to Anchor Points, and at a higher level, MM requires a single upstream node to maintain state of nodes within their responsibility. The state and context maintenance leads to bottlenecks, since any single entity has finite physical resources. We describe a H/C architecture in the context of GPRS. The RNC, the intelligent part of UTRAN, performs data ciphering, data compression and radio resource allocation. The GPRS SGSN performs user authentication, stores ciphering keys for each user and forwards data to the MN In Accordance With (IAW) bearer establishment routing & Quality of Service (QoS) info. The number of users and/or traffic rate, therefore, impacts the SGSN that maintains a per-user context and lies on the forwarding data path. 3GPP reduces this scalability issue through Direct Tunnel Encryption (DTE). With DTE, data on the forwarding plane does not need to pass through the SGSN. DTE directly tunnels data from the GGSN to the RNC. [Daoud 793]. 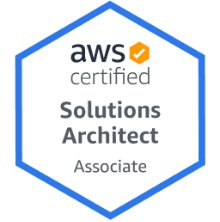 Why do we use flat architectures? 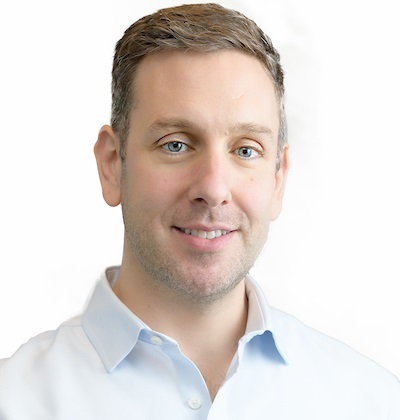 Flat architectures enable high scalability because (in their desired end state) they can remove centralized anchors (main performance bottlenecks) and forward traffic in a distributed fashion. They enable broadband access evolution. Without central node resource or hierarchical concerns systems can use range extension of RANs through unmanaged micro-, pico- and femtocells. With direct connect integrated and IP-enabled radio base station (BS) to the IP core infrastructure, the system enables easy interoperation between heterogeneous wireless technologies which facilitates infrastructure sharing for the operators. Flat eliminates access technology specific centralized components. A “single box” (such as eNodeB) removes the insertion and queue delays of the hierarchical/ multi-element access and core NW approach. A single box approach removes feedback time of inter-module COMM (i.e. handle signaling locally) and enables cross-layer optimization schemes (improves performance). In addition, general-purpose IP equipments drive economy of scale. Also, fewer integrated components drive reduced OPEX since removing single points of failure results in greater reliability. Eliminating inter-layer complexity reduces suboptimal routing situations and realizes advanced resource efficiency. [Bokor 46]. I’ve condensed the text of [Bosch 3864] into the table below. Mobile engineers work towards an ultra flat architecture (UFA). The UFA contains one node, a base station (BS), which executes both data forwarding plane and control plane functions and includes the IMS. 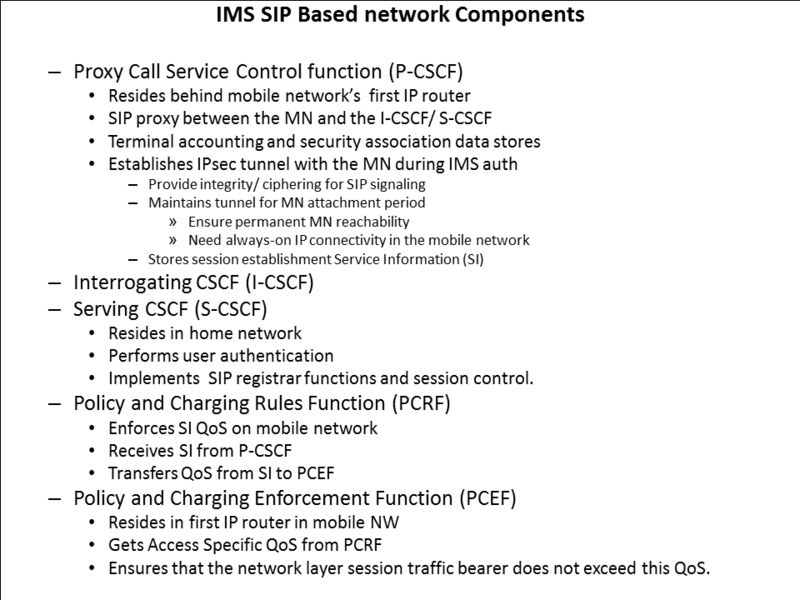 The UFA distributes IMS and mobile NW functions into the BS. The establishment and MM procedures integrate QoS and controlled via the NW. [Daoud 797]. Now that we have discussed the differences between H/C and Flat architecture approaches, we now look at one of the most important functions of mobile packet switched architectures, mobility management (MM). Older MM solutions rely on H/C architectures since they employ anchor nodes for mobility signaling and user traffic forwarding. H/C MM plumbs explicit routes (or tunnels) through the hierarchy of the system to one or more base stations that maintain wireless connections with a mobile. In the UMTS packet service, for example, the GGSN forwards the IP packets to the SGSN which then tunnels the data to the RNC which processes the IP packet into transport blocks and forwards those transport blocks over ATM to the Node Bs. [Bosch 3865]. Consider a mobile in a paging area (a set of BS). In the H/C a central node (e.g. RNC, MSC or SGSN) maintains available mobiles for paging areas. If the central node receives an incoming call for a dormant mobile phone it initiates access-specific paging functions to the paging area. All the BS in the paging area transmit a page over the paging channel in their cell to find the mobile. The mobile receives the page, wakes up and re-establishes contact. The central node then delivers the IP packets. [Bosch 3865]. Flat systems, however, do not have a central anchor for call or IP packet receipt. A BS assumes the role of the central node (usually the mobile's BS of last attachment becomes anchor point). An incoming call or IP packet now arrives in the last point of attachment. Like the H/C, the anchor point n-point unicasts to the paging area. The BS in the paging areas all page the mobile, and the mobile responds to one of the base stations. If the mobile responds on a different BS than the anchor, the BS relocates state associated with the mobile from BS to BS before initial call or IP packet delivery completes. [Bosch 3866]. Hybrid ARQ (H-ARQ) drives a flat architecture, since it obviates the need for spatial diversity. Spatial diversity drives a H/C. We can have four mobility management approaches, either H/C or Flat, and with H-ARQ or without H-ARQ. I put together a quad chart, derived from the text of [Bosch 3865], that summarizes the different approaches. To avoid anchor points, or any notion of H/C in MM, we use distributed mobility management or DMM. I’ve summarized the text of [Bokor 44] below. Ali discusses two IP based MM approaches in which the UE preserves his IP address, aka home address. In network based MM, the NW (access GW) detects if the UE changed his point of attachment. If so, the NW provides the UE with the same IP address, updates the mobility anchor in the NW and the packets arrive at the new UE point of attachment. The UE functions independent of MM signaling. In client-based MM, the UE obtains a new local IP address upon move, which we call the care-of-address. The UE updates the home agent and the home agent maintains binding between care-of-address and home address of UE. [Ali 59]. 3GPP uses PMIPv6 for IP MM between 3GPP & non3GPP (and also optional for intra3GPP). PMIPv6 provides handover capability within and between access systems with no perceivable service interruption. PMIPv6 minimizes delay from MM procedure with efficient use of resources. Wireless resources could be a potential bottleneck, so PMIPv6 minimizes UE involvement in MM (improve the battery life). PMIPv6 introduces the Local Mobility Anchor (LMA), the equivalent of a home agent that provides the topological anchor point for the home network prefix and manages the binding state of the mobile node. The PMIPv6 Mobile Access Gateway (MAG), acts as the proxy (foreign) agent for the terminal and handles the mobility signaling (e.g., a proxy binding update) toward the LMA upon terminal movement. [Ali 59]. In summary PMIPv6 for 3GPP EPC Release 8 provides inter-access system mobility, enables a common packet core for various access technologies, provisions QoS and executes seamless handovers. PMIPv6 achieves non-optimized handovers between 3GPP accesses and other non-3GPP accesses and optimized handovers between E-UTRAN and eHRPD. PMIPv6 supports UE multiple-access to EPC, provides MM and controls individual IP flow routes between different radio interfaces. [Ali 64]. Mobile communication systems move towards a flat IP architecture. Flat systems reduce complexity and leverage the technology of IP networks. This paper discussed the reasons behind Hierarchical and Centralized systems, and then followed their evolution to Flat and then Ultra Flat architectures. In addition, this paper discussed the evolution of the packet switched component of mobile systems. 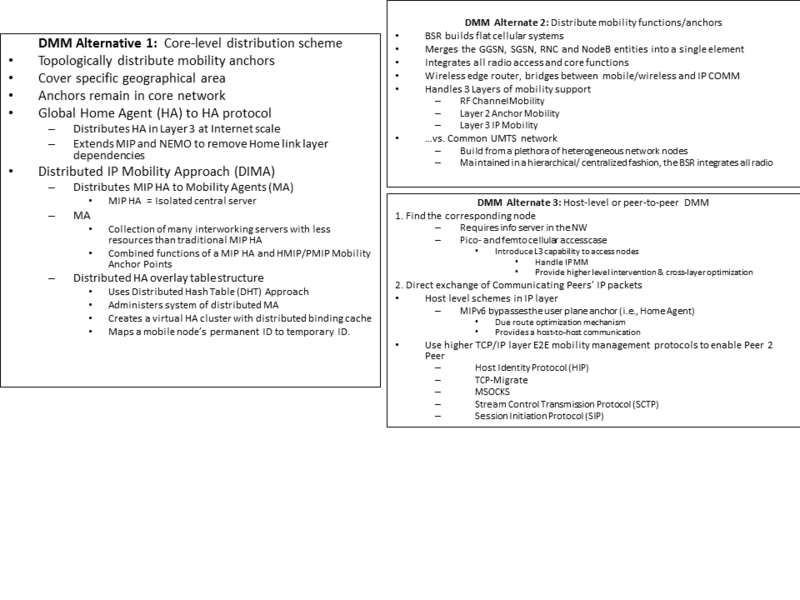 This paper also addressed scalability concerns and focused on the evolution and types of mobility management schemes.